Back by popular demand, the first swap this year will be a phonics miniatures swap, for those who joined last time, I will be sticking to the same rules. 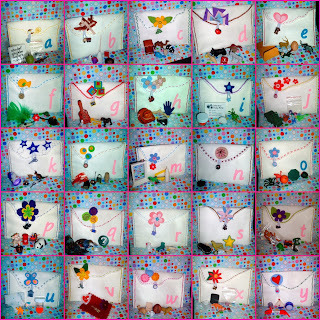 For this swap you will need 2 sets of 10 miniature items suitable for the phonics sound pouches/boxes. I will put all participants into groups of three so everyone will send 2 packets and receive two. You must send 2 packages, each containing 10 small objects. You must notify your partners when you have sent your package and when you have received theirs. The objects should not be made of food due to the customs laws, some countries don't accept food in the mail and it would be a shame for someone to miss out on their package for the sake of a peanut or something of the like. A list with the package, naming all the objects, it might be obvious to you what everything is but someone else might not get it, especially if it is a cross cultural swap. Please put '2009 Phonics Swap' in the subject line (this helps me keep the emails organised). Even if you have joined swaps before, please send as a new email. Swap closes Jan 14th, parcels to be sent out by the end of January. Q. What size should the objects be? I should have said the items should be somewhere between 2 and 10cm, key fob size. Hmm bit hard to define, when I made my pouches I was lucky enough to get a box of miniatures from someone who was selling them really cheaply. Some of the things in the box were great, other things I would call 'tat' like cheap crappy plastic toys such as a little car that the wheels fell off and another object where it wasn't moulded properly so the edges were sharp. So, I suppose I mean, if it is a well made, well detailed plastic object then it should be OK. I have just picked up some sushi magnets that look realistic, I have been trying to get the crappy plastic objects out of the pouches as I have found things to replace them with, it is difficult with some of the letters though. If you click on the 'm' bag you will see a green motorbike and a milk bottle - that is what I mean by crap! I think 'p' has a good example of objects, the pig and panda are ceramic, a brass pan, a wooden post box and some Mexican people. Q. How much should we spend? Obviously less is best! I don't put a price on swaps because what you can buy for $5 in one country you can get twice as much in another, doesn't seem fair. Keep you eye out in dollar shops/¥100 shops, charity and thrift stores, garage sales. Look for things that are packaged together, you might drop lucky and find 5 objects in one bag, I found a bag of doll house tools for a couple of hundred yen, it had 6 tools in it. Look around the house, are there any key fobs you have forgotten about in the bottom of a draw? Doll house items are usually a good size, are you handy with your hands? Why not make something? Q. When do we have to mail the packages out? I will send your swap partner groups at the start of July then you have until the end of the month to get them sent off. Q. Do I have to include anything else? A letter/postcard telling a bit about yourself is always nice, I like to think that the swaps are for building friendships as much as they are swapping objects. International postage can get quite pricey so I recommend keeping the package light. There are some photos here, here and here from previous swaps. Can I join the swap? Maybe not this one, because it looks as though I am too late, but maybe the next?